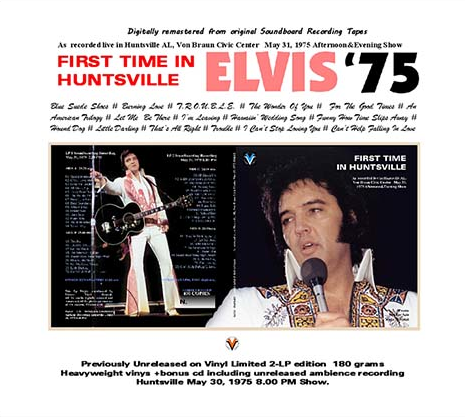 First Time In Huntsville, SPECIAL DELUXE COMBO LP Double Set & CD vol.1. To be released soon (end of October) from the "VV" label for the first time in vinyl both the shows of the second day on Huntsville, AL May 31, 1975, included as a bonus the unreleased ambiance recording from the opening show of the tour, Huntsville AL May 30, 1975. As Always VV attitude is to present Elvis at the peak of his possibility and without doubt, this double set present Elvis still at his top. After shedding some extra weight the man is ready to face his second tour of 1975. “Elvis was an impressive sight in his new jumpsuit” delivering incredible shows. If Rock is attitude, the man still got it. << Streamlined Elvis still has the old magic>> was the headlines of the Huntsville review report. The king is back in good shape, both physically and mentally. The second tour started with 5 sold out concerts in Huntsville was the audience created an incredible atmosphere in the hall, Elvis’ spirit and voice knocked them all out. We are glad to include the cd with the opening show, The sound is decent if you want to live the atmosphere of an Elvis concert in 2018 this is the right tape. We can guarantee that Elvis was greeted with incredible enthusiasm; the popularity in the live scene in the middle of 1975 is at the maximum level. The tour present Elvis still at the top of his rocker possibility, He looks great in his impressive new Silver Phoenix and delivery an great show with a great version of the up-tempo rockers Burning Love and T.R.O.U.B.L.E. together the double vinyl set a Bonus the CD and incredible large Poster 90x60 cm both sides printed. 19. Why Me Lord ? 16. Why Me Lord ? Good show...taken from cd-r means...bad sound.